Craving cheesy comfort beyond the usual suspects? 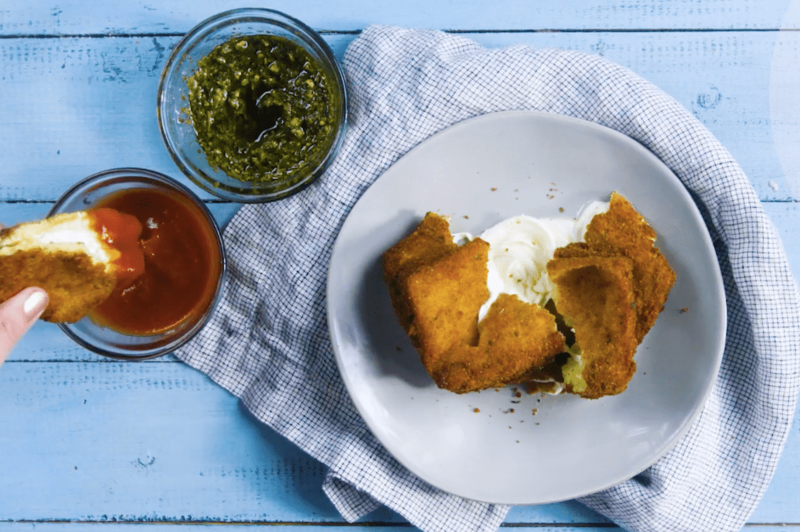 Try mozzarella in carrozza, or “mozzarella in a carriage.” The Italian love child of mozzarella sticks and grilled cheese, this deep fried sandwich oozes with warm, melty cheese. Give it a dip in marinara or pesto sauce and buon appetito! Pour oil to a depth of 2" in a 6 quart Dutch oven. Heat over medium-high heat until your deep-fry thermometer reads 350°. Divide mozzarella slices among 4 slices of bread. Season with salt and pepper, and cover with the remaining cheese slices to make 4 sandwiches. Trim the crusts. Take out 3 bowls and place the flour in one bowl, the eggs (cracked and whisked) in another and the breadcrumbs in the last bowl. Dredge each sandwich in flour, coat in eggs and coat in breadcrumbs before putting on the frying pan. Fry until golden brown, about 1-2 minutes on each side. Let each sandwich rest for about a minute after it's been removed from the oil, then spoon some sauce over the top and serve.